Note on audio quality: the sound in this video does not accurately reflect the actual sound heard and felt in the installation space and due to its low frequency may be distorted or not heard at all with portable devices or laptop speaker systems. A subwoofer, larger desktop speakers or headphones are recommended. Have you ever heard the hum in a sound system when the volume is cranked up or a cable is connected the wrong way? That is the sound of the electricity from our power points and it has an almost constant frequency of 50 cycles per second. 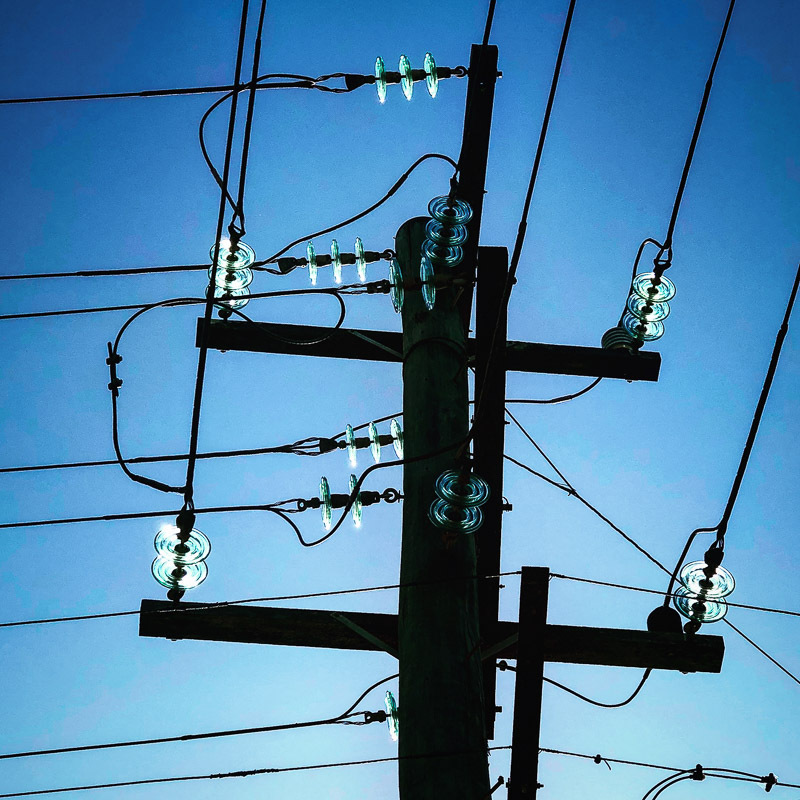 It is the signal that synchronises the vast complex machine that is the electricity grid stretching from North Queensland to South Australia and Tasmania and all the generators connected to it. As demand and supply change on the grid the frequency varies slightly, sometimes dramatically, and in this room the hum is deliberately amplified so we can listen to the ebb and flow of energy on the grid. There is another hum – that of the activity driving the massive transformation of our energy system. In the media we only hear of rooftop solar, Snowy 2.0, the Tesla battery and political standoff. These are a small part of a much bigger transformation that is partly driven by a need to reduce our carbon emissions, but mostly driven by the adoption of new technology by investors to make money or consumers to save money. The live energy and money flows across the country, the live tweets from those playing a part in the transformation, and our blind faith in technological miracles offer another perspective on this much bigger story. This simulated audio file illustrates the audible interactions experienced within the installation. Left channel : 60 seconds at 50Hz | Right channel : 20 seconds at 50 Hz, 20 sec at 49.9 Hz, 20 sec at 48 Hz. Note: this will not play correctly on most devices; larger desktop speakers, headphones or stereo is recommended to reproduce the low frequency. There is a massive transformation happening in the way we generate electricity. But there is also a widening gulf between the average citizen’s knowledge of what that transformation means, the knowledge of the experts we trust to guide it, and the proclaimed knowledge of those entrusted to lead it on our behalf. How can we reduce that gulf, thereby enabling more citizens to participate in the dialogue on our goals and priorities? Hum uses the sound of the 50-hertz alternating current from our power points to engage the visitor in how the grid works. 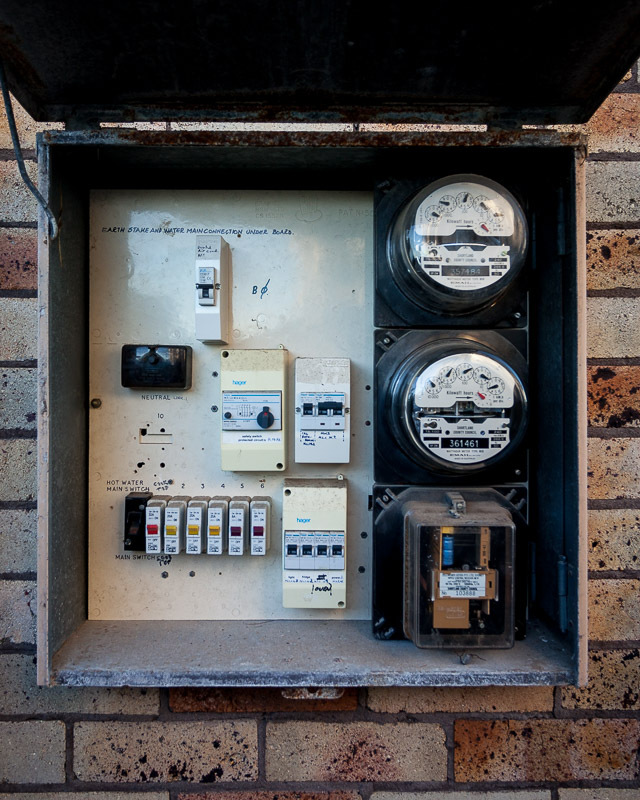 Not only does this current operate at an audible frequency, but it is also the signal that controls all the sources of energy across the 40,000 km of the grid within the eastern states of Australia. All generators must synchronise perfectly with this signal and when the demand or supply of electricity on the grid changes, the frequency changes as well and this is the indicator to all generators to increase or decrease their output or even to black out areas of the country. If our ears were tuned to it we could hear the collective actions of every citizen and business as they consume electricity. In the installation, an additional sound from a constant 50-hertz signal highlights audibly the subtle changes in the grid frequency. 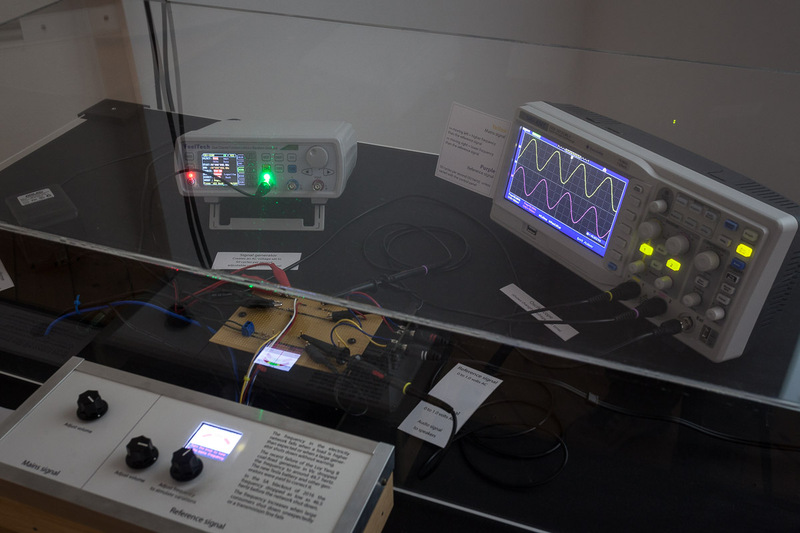 Through large speakers, an oscilloscope and controls for volume and frequency, the work encourages an exploration of what various conditions on the grid sound and look like. Against this audio backdrop, two screens display the extremes of knowledge and belief around the energy system. One shows the limits of the average citizen – the lights stay on and we pay our ever-increasing bills, but beyond the omnipresent ‘telegraph’ poles it is all a mystery. 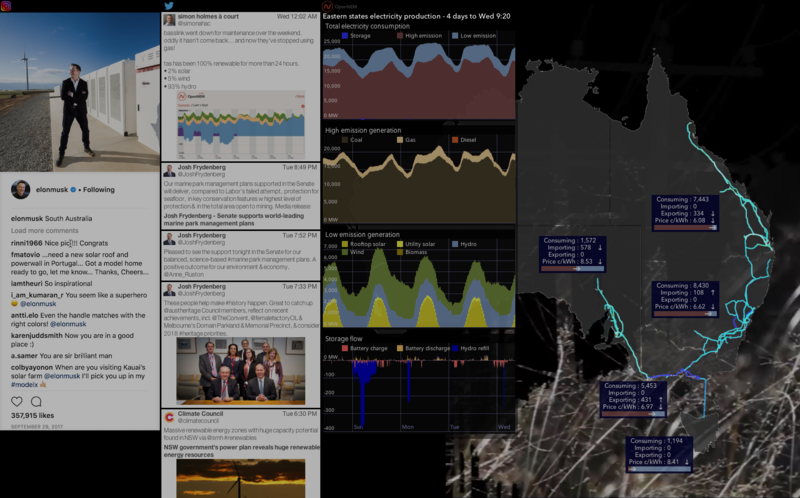 A second screen shows the complexity and reality of the grid and its transformation. Graphics depict the real-time state-by-state distribution of energy on the grid and how it is generated against the three current paradigms of high emissions, low emissions and storage. A live twitter feed hints at the debates between the actors in the transformation, while the comments praising Elon Musk and the Tesla battery suggest a faith in a technology ‘fix’ that borders on religion. This work is an early outcome of PhD research into artistic strategies for expanding the opportunity for citizens to participate in discussion and action on local and global social and ecological crises. ‘Test bench’ for exploring audio and visual properties of the mains frequency and grid conditions. 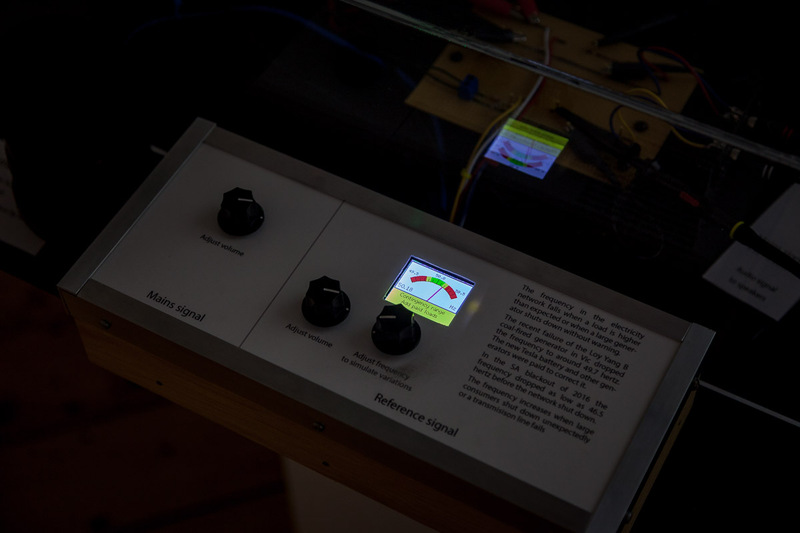 Hum, 2018, two-channel audio system and subwoofers, two-channel video projection, real-time data visualisation, electronics, Arduino, computer, domestic furniture. … the dedicated “tweeters” contributing to a rational discussion on the energy transformation: Geoff Eldridge, Simon Holmes-a-Court, Dylan McConnell, RenewEconomy to name a few.